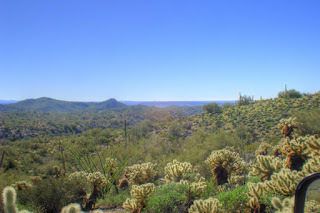 Our latest favorite fishing hole is Chaparral park in Scottsdale. Chaparral has a 10 acre "lake", The Arizona Game and Fish Department stocks it with trout in the winter and catfish in the summer. 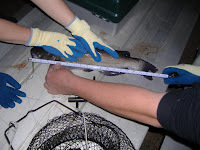 On most occasions we catch some good sized trout or catfish. 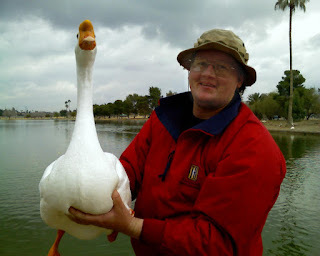 Other than acting indignant the goose did not put up much of a fight. He used to use a net and corn as bait, but we have since learned that if they are hungry enough the pigeons will land on your hands and eat. The pigeons appear to do something interesting, at least one of them will land on your hand and rip off big chunks of bread and throw it to the ones gathering below. mostly it is a free for all with them landing on top of each other and jostling for position. 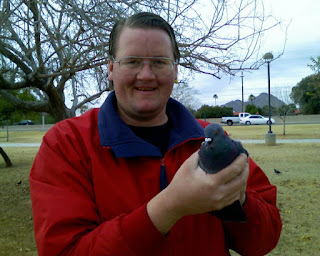 At one point, one pigeon chased another one up my arm to make him go away. Once in your hands or on the ground in front of you they can be caught rather easily. Oh and spare me your comments on how pigeons are sky rats, or are filthy, and disease ridden. They are no cleaner or dirtier than any other wild bird on the planet. I find it quite humorous when people bring their kids to this park to feed the birds, as soon as bread is thrown on the ground every pigeon in the park shows up and swarms the poor kid, scaring the crap out of them (the kid not the birds). Who would have thought that the Garfield comic strip would still be funny if you removed Garfield. This is what I do all day long! During the winter my brothers and I go hunting in and around the FMR. 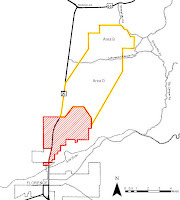 The FMR is located approximately 6 miles north of Florence Arizona. Contrary to most maps of the area it extends north another 8 miles. it encompasses about 40 square miles. Since we started hunting in and exploring around this area we have walked through a large portion of it as you can see in the image below. 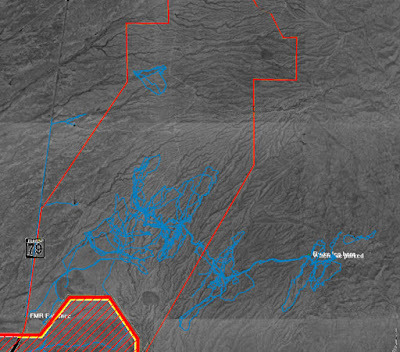 The blue lines indicate our tracks taken from our GPS devices. There would be more of them but for the first several month's we were out here we did not have GPS. I then got a GPS and in December of 2005 all 3 of us got GPS FRS radios. On an average trip we each walk from 3 to on one occasion about 8 miles. Generally we walk about 4 miles each time we are out there. This area in late spring and early winter gets to be very green. We have seen or found a lot of strange things on our hikes. Here's a guy that was flying around in a paraglider. Here is a Video of the Mine shaft from above that had water in it. 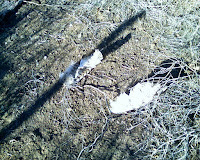 While hiking through what we now know is private property, we found a javelina that was possibly shot out of season. 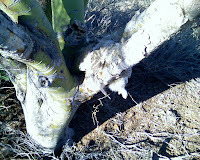 Quite possibly the strangest thing I found was the remains of a white owl that had been jammed between the limbs of a palo verde tree with it's wings ripped off (weird). The hood to a truck from the 20's or 30's. A Bed frame(intact and setup with no mattress). The head of a pick. The head of a shovel. Pieces from military flare signaling devices. Parts of 155mm illumination flares. A fired 37mm practice anti aircraft round. 5 foot lengths of PVC pipe embedded vertically in the ground in random locations. Bones of various animals (no humans yet). A rusted trailer (with flat tires) loaded with the gas tank from a car or truck and roofing shingles. intact, unbent, un-rusted Duct work. Miles of steel military communications wire. An old barely readable wooden sign stating something about "you are now entering a free bird buffet". In almost every case these items were located at least a mile from the nearest dirt road. The duct work specifically would have required 2 people to carry it. The PVC pipe is an enigma as we find them in the weirdest places. In one case I was trying to get through some dense brush and trees and in the middle of this area was a length of PVC pipe embedded vertically in the ground. Desert tortoise (bones don't count). I have wondered what some of the images I have sold on dreamstime were used for, well I found 1 of them in 2 publications available for download from the internet: Here (Bottom page 2 of the PDF), and Here (Top Page 1 of the PDF).